Registration is now open (as of April 2016). The final symposium programme is available now (as of May 2016). ILSI Europe was pleased to organise the 6th International Symposium on Food Packaging: Scientific Developments supporting Safety and Innovation. This event was supported by the Packaging Materials Task Force. CONGRATULATIONS TO DR VERA BAUMGARTNER, MS NINON PIACERE AND MR JULIEN VEYRAND FOR WINNING THE AWARD FOR BEST POSTER!! The ILSI Europe International Symposia on Food Packaging are held every four years and are internationally recognised as a scientific forum to discuss the science that ensures the safety and quality of food packaging. Following the success of the 5th Symposium on Food Packaging: Scientific Developments supporting Safety and Innovation held in Berlin in November 2012, the 6th symposium was held last November 2016 and emphasized again the innovations in the area of food packaging. Future Challenges in Food Packaging Processing and Food Processing Equipment. The participants reviewed and debated recent advances in the science supporting the demonstration of the safety, quality and innovation of food packaging. Dissemination of results of on-going research were combined with examining the implications for the future of controlling packaging for foodstuffs. This multi-disciplinary meeting was of interest to those active in issues associated with the safety and quality of food packaging, particularly food scientists, chemists, mathematicians, physicists, packaging specialists, control authorities, regulators and risk assessors. It brought together those involved in basic studies, those responsible for bringing innovations to the market place, and those charged with ensuring the safety and quality of food contact materials. The symposium was held in Barcelona, Spain. For more information on this event, please contact Dr Cyril Marsaux at cmarsaux@ilsieurope.be, Scientific Project Manager. More information on the Packaging Materials Task Force is available here. Check out our podcasts here to listen to Professor Cristina Nerín and Dr Peter Oldring talk about packaging, emerging technologies and NIAS. Call for Abstracts for Oral Presentations has been closed on 15 February 2016. Call for Abstracts for Poster Presentations has been closed on 23 September 2016. The programme covered a wide range of subjects related to food packaging. For the full programme, please click here. All presentations and posters (upon authors’ agreement) can be found HERE. Late submissions: 2 new posters have been accepted in Session 1 ‘Progress in Risk Assessment’. A Selection Committee composed of internationally-recognized scientists in the field of Food Packaging evaluated the posters displayed at the symposium and selected the best three posters. Posters of the highest scientific quality were selected according to how substantial the issue they addressed was, how novel, innovative and applicable the work presented was, and whether it helped to solve any theoretical or practical problem. The Selection Committee also took into account how comprehensive, clear and consistent the work was. The three winners were announced on 18 November in plenary before the closing remarks and received a certificate attesting of the excellence of their research. Furthermore, they have the opportunity to publish their work as a full paper together with the oral contributions in a dedicated issue of Food Additives & Contaminants Part A, provided the paper is accepted after peer-review. Finally, the winners can choose between a waived fee for a future ILSI Europe event (e.g. 7th Food Packaging Symposium in 2020) or an invitation to present their latest research during the scientific session of an ILSI Europe’s Packaging Materials Task Force meeting in Brussels, on a mutually agreed date (travel in economy class covered up to 500 EUR + 1 night accommodation, for non-industry only). A unique opportunity to strengthen their network and increase their visibility among leading companies in the area of Packaging Materials. *Where the presenting author is not the first author. • Please refer to the scientific programme to see when your presentation is scheduled (day and time). • Your presentation should last maximum 20 minutes. • Novelty is important, please make sure you present new data / concepts. • Presentations should be PowerPoint (.ppt or .pptx) or PDF files. • Please bring your presentation on a USB-stick to the event (as PowerPoint or PDF). • The poster walls are 241cm (height) x 95cm (width). Please ensure that your poster fits into these dimensions. • Posters should be in portrait format (landscape format is not accepted). • Poster presenters have to print their own poster and bring it to the venue. You will have the opportunity to hang your poster on the allotted poster wall on 16 November in the morning, so please arrive early. • Double-sided tape will be provided to hang your poster. Each poster presenter has been attributed an POSTER CODE. Please refer to this code to locate where a given poster will be displayed at the venue. Poster presenters are expected to hang their posters BEFORE 12:00 on Wednesday 16 November and to take their posters down by 14:30 on Friday 18 November (posters still hanging after this time will be discarded). Posters will be displayed during the entire symposium. If your poster code contains the letter ‘B’, please be at your poster on 16 November at 17.20, 17 November at 12.20 and 16.50, and 18 November at 10.40. Registrations can only be made on-line with a credit card and should be completed in one single process. It is therefore advised to have your credit card ready at hand before starting the registration process. Please note that some credit cards have a special security code in addition to the 3-digit code specified on the card. This additional code is needed to complete your registration and payment by credit card. Upon completion of the registration process and payment by credit card, you will receive an official confirmation of your registration by e-mail. An invoice will be sent to each registrant by e-mail shortly after the registration is completed. If the invoice has to have a different address than that provided for your registration, please provide the address by e-mail at packaging.sympo@ilsieurope.be. Please note that registration is final only upon receipt of payment of the due fees. If you wish to have your complete details included in the conference document that will be provided to all registered participants at on-site registration, it is advised to register before 2 November 2016. Cancellations received until 31 August 2016 will be refunded minus 20% handling charges. Conveniently located 5-minutes’ walk from the famous Plaza de España in the Montjuic area, this 4-star deluxe Hotel is easily accessible. The Aerobus Airport shuttle buses bring you in 30 minutes to Plaza de España and Barcelona’s historic centre can be easily reached by metro (metro station España with Red Line L1, or Green Line L3). Barcelona, the cosmopolitan capital of Spain’s Catalonia region, has a rich historic heritage and is today an important cultural and economic centre of Spain. The city’s Gothic Quarter bears witness to the splendour enjoyed by the city from the 13th to the 15th centuries. With the development of the textile industry in the mid-19th century (Renaixença period), Catalonia regained prominence and its independence from the Bourbon’s yoke. The 20th century ushered in widespread urban renewal. Particularly renowned are the architectural works of Antoni Gaudí (La Sagrada Familia, La Casa de Batlló, La Casa Milo, Parc Guëll) and Lluís Domènech i Montaner, which have been designated UNESCO World Heritage Sites. Please note that there are no more rooms available at the preferential rate negotiated for delegates in the Crowne Plaza Barcelona – Fira Center. Recognised as the largest in the city – their standard rooms are 44m2. Each room has an amazing king size bed (2mx2m) or two queen size beds (1.35mx2m) in the twin rooms. The furniture includes Stressless® armchairs, a Nespresso machine, a kettle and an ironing set. In addition to its 3200m² of conference and event space, it has a business center with a few computers available in the lobby for hotel clients. The Hotel also has a Spa and Wellness area equipped with a fitness room, saunas, steam bath, and possibility for beauty treatments and massages. 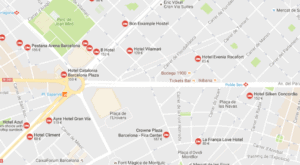 Hotel reservations in the Crowne Plaza Barcelona – Fira Center were made on-line with a credit card that serves to guarantee your bedroom booking. No charging will be applied except in cases of late cancellations or no-show. Your reservation should have bern confirmed by e-mail. Modifications and cancellations of hotel reservation can be made via this electronic confirmation. free access to the spa and fitness facilities. Access to the Club floor and Club lounge is possible for a surcharge of 30-€/room type/night in a Club Room (e.g. exclusive Reception and Concierge service, exclusive breakfast room, premium drinks and snacks throughout the day). For more details, click here. Cancellations, modifications or substitutions of hotel reservations are possible and must be made in writing via the received electronic confirmation or by sending an e-mail mentioning clearly your reservation number to groups@crowneplazabarcelona.com, +34 93 426 22 23. Cancellations received in writing before 7 November 2016 are free of charge. For any cancellations received after 6 November 2016 and in case of no-show, the hotel will charge the full stay on the credit card provided when the hotel booking was made. Substitution of hotel reservations are possible if made in writing to the Crowne Plaza Barcelona – Fira Center, groups@crowneplazabarcelona.com, +34 93 426 22 23. The International Life Sciences Institute, Europe (ILSI Europe) is part of a non-profit, worldwide foundation established in 1978 to advance the understanding of scientific issues relating to nutrition, food safety, toxicology, risk assessment, and the environment. ILSI Europe brings together scientists from industry, academia and government to jointly provide the best available fact-based, objective science on key public health issues.